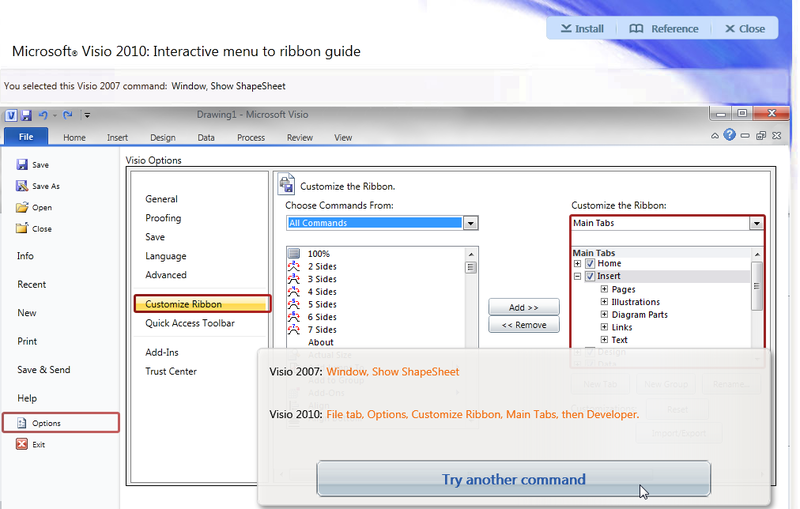 You are here: Home / General / Visio 2010 / Menus to Ribbons: Find Commands in Office 2010! I was worried that I was going to have to develop something to solve the problem of “translating” old menu commands to new ribbon commands. 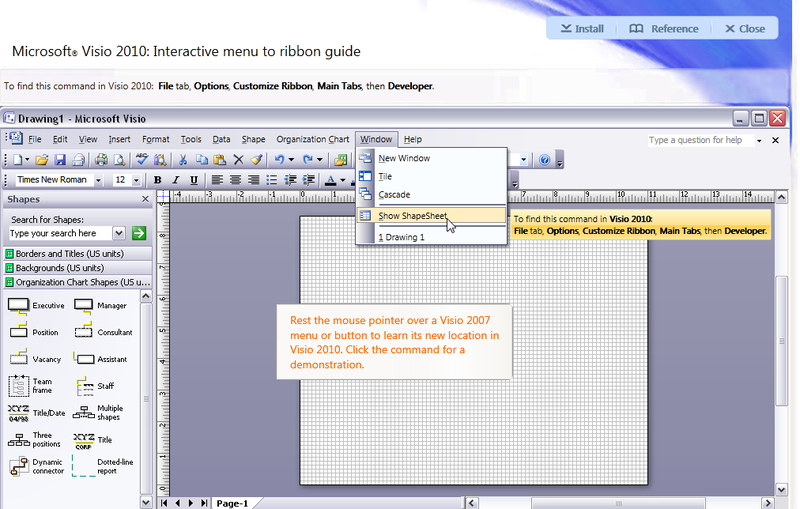 Indeed, I’ve already written Visio 2010 Ribbon Commands Mega List to help you use your browser’s text searching functionality to find commands to add back to your Visio 2010 ribbon. Pretend You’re in Visio 2007! This interactive Visio command finder uses Silverlight to give you simulated user interfaces in Visio 2007 and Visio 2010. 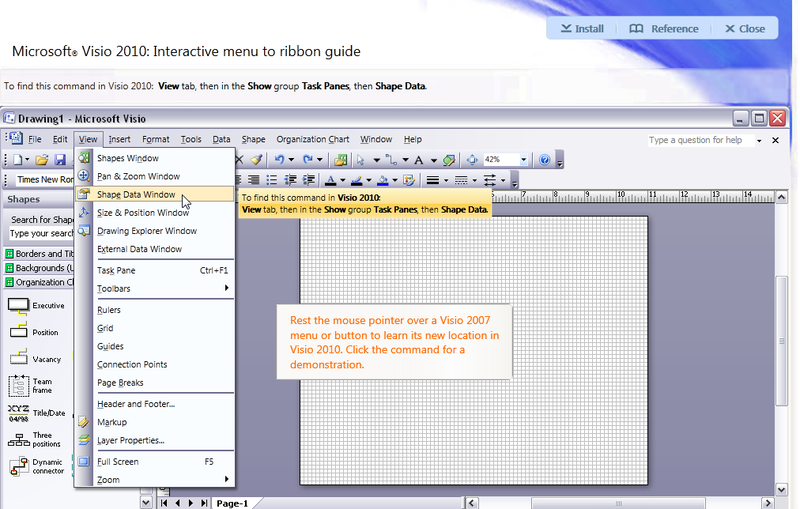 They’re kind of fun to use, and put you into a virtual Visio 2007 environment, where you can go through the menus as if you were using Visio 2007! Here we go to show the Shape Data window. 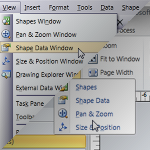 In Visio 2007, it was View > Shape Data Window. When we click, the screen rotates (in 3D!) 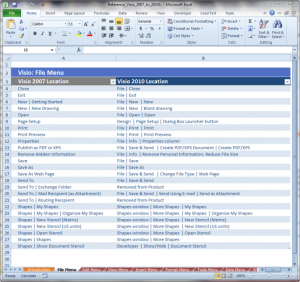 around to show where the item is in Visio 2010. Easy enough to find under View > Task Panes > Shape Data. The interactive viewer didn’t feel the need to mention the alternative Shape Data check box located on the Data ribbon, though. 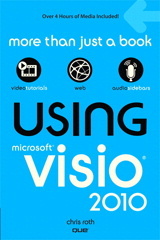 In Visio 2010, there’s a whole production involved. Go into the Backstage area by clicking File. 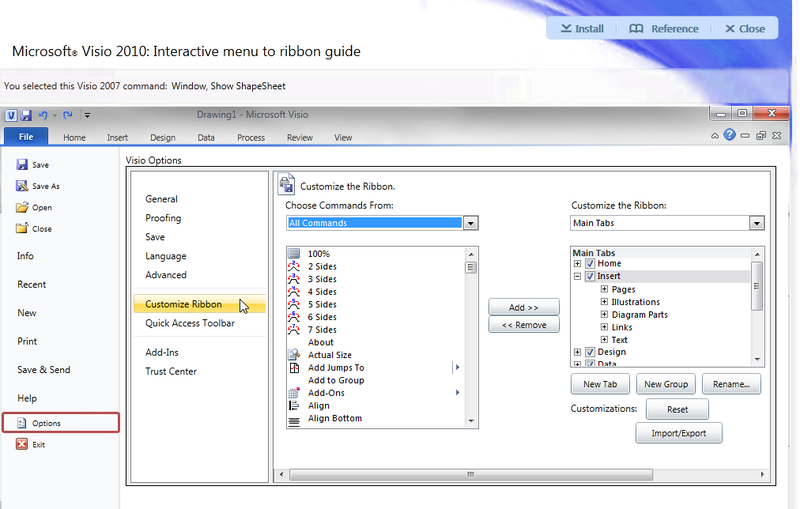 Click on Options, then Customize Ribbon…then what? After a few seconds, a pop-up further explains what the visual was supposed to be showing us. 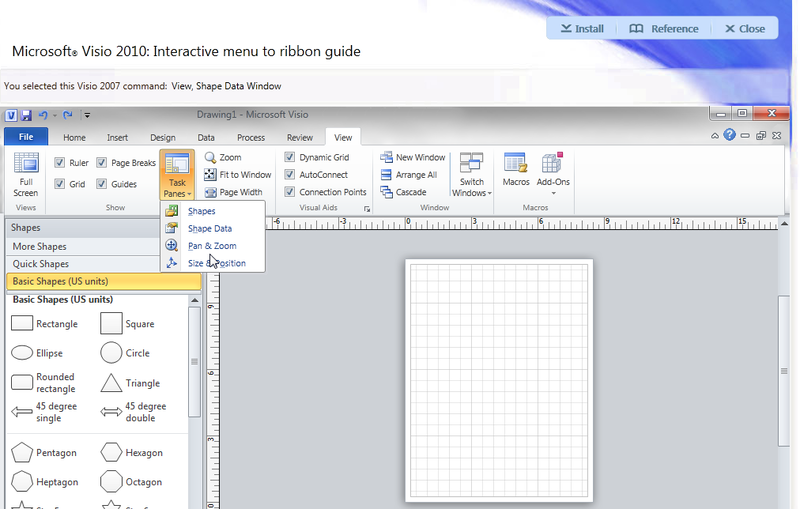 Visio 2010: File tab, Options, Customize Ribbon, Main Tabs, then Developer. So you can’t get to the ShapeSheet unless the Developer tab is showing. Ouch! So the Silverlight Interactive Menu Translator definitely gets points for being fun and…interactive, but it isn’t always super clear. It isn’t complete either. I looked up an operation I use all the time as a Visio devloper: open group. In Visio 2007, it was simply: Edit > Open Group. In the interactive translator, it wasn’t in the 2007 menu at all. They probably developed some sort of tool that made this thing automatically, and open group requires a shape to be selected in the drawing window, which isn’t possible in this Silverlight tool. I think the interactive locators are great if you’ve got a sort of visual- or muscle-memory way of remembering command like me. If you ask me the name of a command, I probably can’t tell you. But I can find my way there once I see the menus laid out on the screen in two dimensions! If you like lists and text and information that can easily be printed, then there’s a solution for you too! 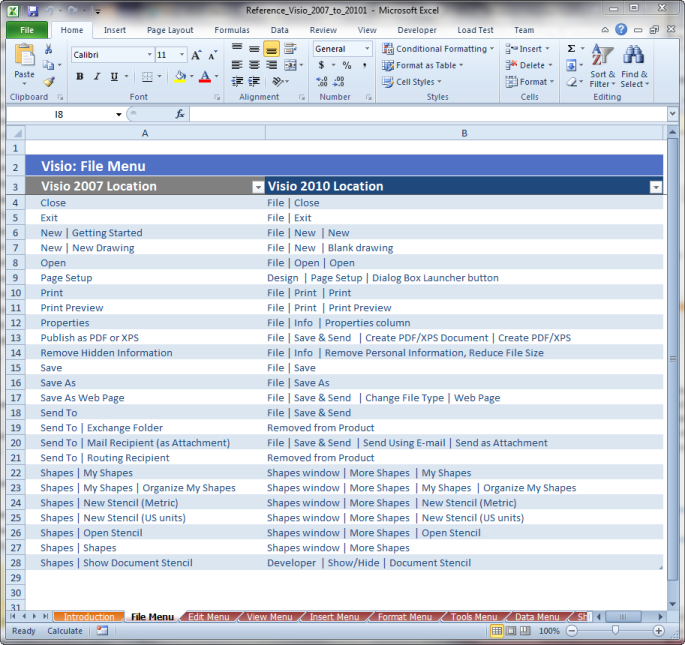 Thanks to Scott Helmers for getting the ball rolling with an e-mail amongst the Visio MVPs! This is really useful – i’ve been reading through all the interesting posts on this site – i’ve recently starting working with Visio 2010 but didn’t know this – so THANKS! I wish the article would have mentioned the location of the “Open Group” under 2010. I finally found 1 place where I can get it, but surely it must also reside elsewhere as well. I find that these new Ribbons are great when you’re starting to learn a program. But if you knew most of the commands for that program and took the habbit of customizing your toolbars (which was a heck of a lot simpler before! ), then these Ribbons are just extremely frustrating! Just about every single command you do, takes 1-2 steps more… multiply that by possibly hundreds of commands when working on a decent size project… at that sure adds up quickly! Bit if MS tells us it increases our productivity… it must be true. I’ll give MS this though… as far as the UI within the drawing area is concerned… Visio 2010 has some nice new features (Shape Alignments and Distributions visual cues are pretty cool!). Nice way to sum it up, keke! Thanks for the group/ungroup comments! The Developer Tab in Visio 2010 also has a Shape Design group with some Group-related commands, but open group is oddly missing from the drop-down list!